Certifications: Smart Pro has been designed and manufactured in conformity with CE mark European standards and is CB and RoHS certified. The state of the art OBD vehicle key programmer that works with most vehicle makes and models worldwide for easily programming transponder keys, proximity keys and remotes and for reading the PIN codes for numerous manufacturers. 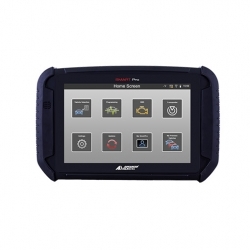 It features an intuitive touch screen user interface and incorporates the entire Advanced Diagnostics Info Quest database with over 5000 vehicle models. It is a flexible, all-in-one solution offering the user a combination of purchase options. Easy to use software interface: Smart Pro features a 10-inch colour touch screen guiding the user through a simple step-by- step sequence for all the key programming functions and procedures. The graphical user interface is intuitive and the software is available in multiple languages. Easy-to-read icons clearly indicate whether the device is successfully communicating with the vehicle or not. All information in one place: Smart Pro incorporates AD Info Quest, a constantly updated database containing over 5000 vehicle model details. Extensive functionality: Smart Pro programs transponder, proximity and slot keys and remotes and reads PIN codes for numerous manufacturers. Further functions include ECU identification, EOBD read and clear fault codes (manufacturer dependent), and archive of previously programmed vehicles. High performance hybrid: Smart Pro is an all-in-one, hybrid solution offering the flexibility to choose from combination of purchase options. You can opt for pay-as-you-go tokens, various UTP (Unlimited Token Plan) packs or you can simply purchase the software modules you use most. You can also change from one system to another according to the evolution of your business. Compatible with the Silca automotive range: Smart Pro has been designed to be updatable over time and is fully compatible with the entire range of Silca transponders and vehicle keys and remotes, including Remote Car Keys, Proximity and Slot Keys, Look A-like and transponder keys. Quality materials: Smart Pro is supplied in a hard body carry case with internal rubber shaped slots for putting all the tools necessary to program keys and remotes. The screen is made of gorilla glass, a resistant and long-lasting material. Easy to power: Power is supplied to Smart Pro via the OBD port, mains cable or an internal battery that gives two hours of stand-alone use. Fast programming procedures: The powerful quad core processor, new hardware and software architecture are designed to save you time. By integrating key programming and PIN reading functions for most makes into one step, the programming process is significantly faster. Fully geared and ready to operate: Smart Pro comes supplied in a hard body carry case together with all the necessary cables and connectors to start working immediately. The case includes: Smart Pro device (AD2000), mains cable (ADC2009), OBD cable (ADC2000), AC/DC power supply unit (ADC2006), USB cable (ADC2004), 50 way to 25 way converter (ADC2001), pin saver (ADC2002), USB flash drive operating manual, printed quick start guide. The case includes spaces for the optional Smart Aerial and Smart Remote Programmer. Guaranteed solution: Smart Pro has a 2-year warranty. All information in one place thanks to the integrated IQ database: All the information needed to program a key is collected in one place, always updated and immediately available. 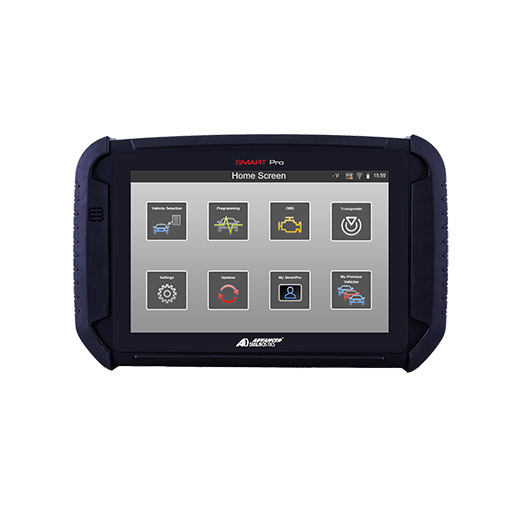 Smart Pro incorporates Advanced Diagnostics Info Quest, a constantly updated database containing over 5000 vehicle model details with information such as vehicle OBD port location, key photos, VIN and engine codes, programming tips, compatible key blades and transponders. Select Manufacturer: You can select the vehicle of interest by accessing an icon driven page with the logos of manufacturers or a grid, alphabetically ordered, with highlights of the latest software modules. Vehicles can be filtered by region for an easy access to the models most relevant for your market. The search can then be made by vehicle (model, year) or by system (immobiliser). Vehicle Info: A simple grid provides all the information to identify the vehicle you want to program, including VIN number, transponder type, immobiliser system, Silca transponder and key reference. Tips and Hints: Advanced Diagnostics expertise at your fingertips: this section provides pieces of advice and suggestions for carrying out all the programming procedures in a more streamlined way. Remote Procedure: This function illustrates all the steps to follow for programming the remote. All the procedures have been carefully tested by AD for accurate results. The procedures are icon driven and intuitive. Guided updating procedure: Smart Pro can be updated via Wi-Fi with step-by-step guided procedures or via PC using the USB cable supplied. When updates are available a notification will appear, while a tick in the status column identifies the modules requiring an update. MySmart Pro and archive: The My Smart Pro section helps keep an eye on token credits, currently active UTP plans, expiry dates, and purchased software modules. Customised data archives and favourites grant easy access to the most frequently used programming procedures. Electronic On Board Diagnostics: The EOBD functions help you read and clear faults not related to the immobiliser. When a fault is detected, the software shows its identification code and description, so you can always make sure the key or remote has been programmed correctly. Optimised transponder management: Smart Pro incorporates transponder identification, presetting and precoding functions for a more streamlined process. Just connect Smart Aerial to the device and follow the instructions. The following transponder types are supported: Texas®, Texas® Crypto, Texas® 80 bit, Philips® Crypto, Philips® Crypto 2 and Megamos® Crypto.